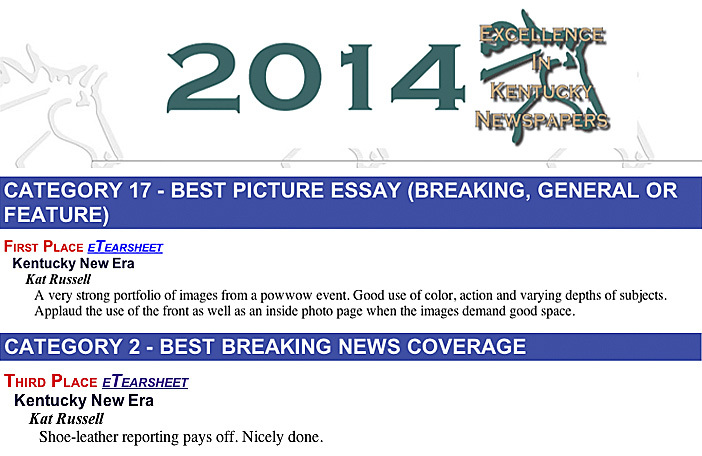 LEXINGTON, Ky. — The Kentucky New Era won 14 awards at the 2014 Kentucky Press Association convention. Leading the way was photojournalist Kat Russell with a first place for best general news photo for her coverage of a Fort Campbell troop return. Additionally, the New Era staff was awarded first place for best sports special section and third place for best website, designed by webmaster John Godsey. In the best front page category, features editor Melissa Larimore won second place, and in the best editorial page category, opinion editor Jennifer P. Brown took third place. Community writer Zirconia Alleyne also took home a second place for best sports feature story. Former night editor Logan Todd won third place for best news graphic, and former sports editor Joe Wilson took third in best sports feature story. Former staff members Dennis O’Neil and Nick Tabor won second and third places for best general news story. Subsequently, The Eagle Post staff swept the associate newspapers category for best sports news photos. The Eagle Post also won third place for best special section. From: David Smith regarding a feature I wrote about his Father, Ken. From: Imelda Gorman regarding a column I wrote about an unsuccessful Halloween event. From: HFD Captain John Burke regarding my coverage of the 9/11 Memorial Stair Climb in Nashville.